I am new to my Cameo and I am making some of the Silhouette Zoo Animals for table decorations for my grandson’s first birthday party. I will be mounting them on chopsticks and then sticking them in a potted plant. So the front will look cute but the back will just be plain paper in the shape of the animal. I would like to cut out a photo of my grandson on photo paper in the shape of the animal and then put that over the plain paper back. I may also need to manipulate the photo by enlarging and cropping so that his face would be sure to fit inside the outline. Would you happen to know the best way to do that? Is photo paper something that the Cameo can cut? Yes, the CAMEO can cut photo paper and yes, you can cut a photo in any shape your heart desires! The CAMEO is a really versatile tool and I happen to agree with Silhouette America’s slogan, “Dream it up. Cut it out.”. 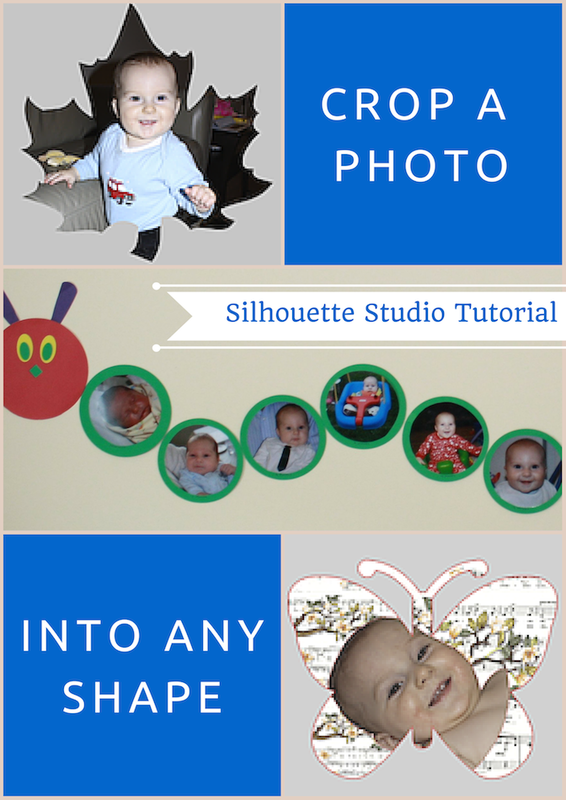 A couple of years ago, I made a Very Hungry Caterpillar photo banner for my son’s 1st birthday. I added monthly baby photos to each circle of the caterpillar’s body to display his growth throughout the year. I think that this project will serve as a great tutorial to address the reader’s question. 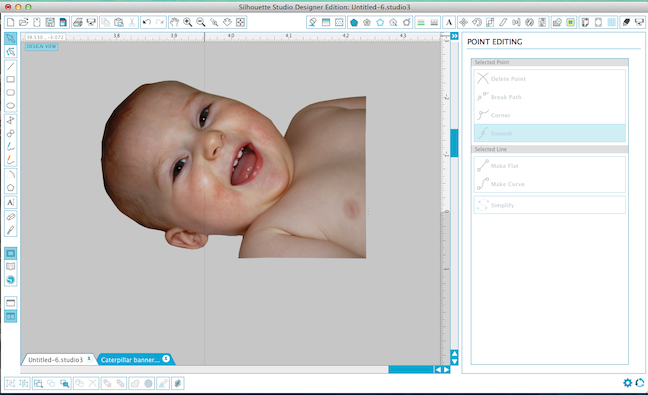 Import your photos into Silhouette Studio. 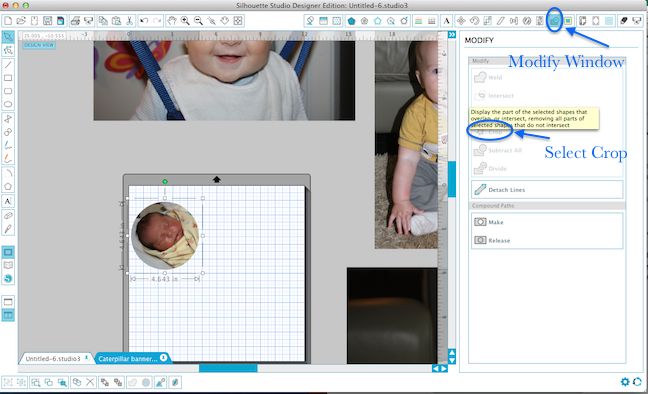 I was able to import my photos by dragging them from iPhoto into Silhouette Studio. Next, use the “Draw an Ellipse” tool to create a circle. Hold down the shift key while drawing the circle to make it perfectly round. I made 13 circles that were slightly smaller than the main body’s green circles. Place one circle on top of each photo and resize the photos as necessary. Open the Modify window and select Crop. Repeat for the remaining 12 photos. In the Design Page Settings window, select letter sized paper. 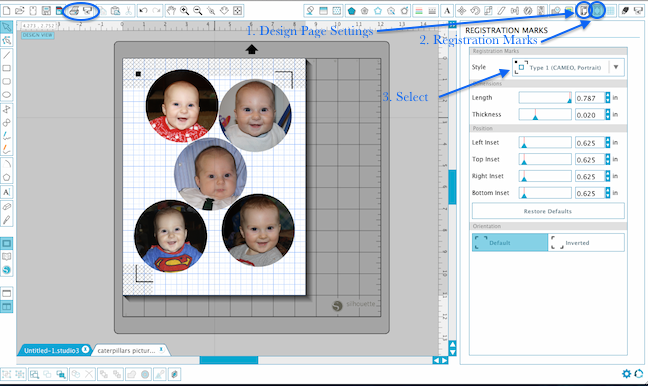 In the Registration Marks window, select Type 1 (CAMEO, Portrait) in the Style menu. 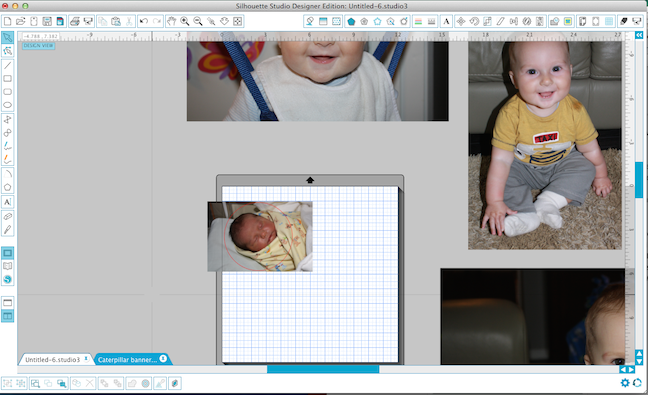 Place the photos onto the page avoiding the greyed out areas. Also, make sure that the pictures are not placed outside of your printer’s boundaries. Print the photos onto photo paper. Once printed, place the photo paper onto the cutting mat. Before cutting, perform a test cut (the test cut button is found in the Send to Silhouette window). Adjust the blade and the paper thickness if necessary. I set my blade to 3 and the paper thickness was 25. Select the Send to Silhouette icon. The Silhouette will automatically check for registration marks. Make sure that the cover of the machine is closed and that it is in a well lit location. That’s it! The photos are ready to be adhered to the green circles. The first example shows a “Trace and Detached” photo with an added background. The second example depicts a photo added to a maple leaf. This example, which I think best represents the reader’s project idea, can be achieved by following the above circle tutorial but instead of drawing a circle, import a design from the library. I would recommend using a shape that is proportionate to fitting the photo. Using a giraffe, for example, would not be the easiest shape to add a photo to as it is an odd shaped design-too tall and too narrow. To make a “trace and detached” photo, please note that this process is quite time consuming because there is a fair bit of editing involved. 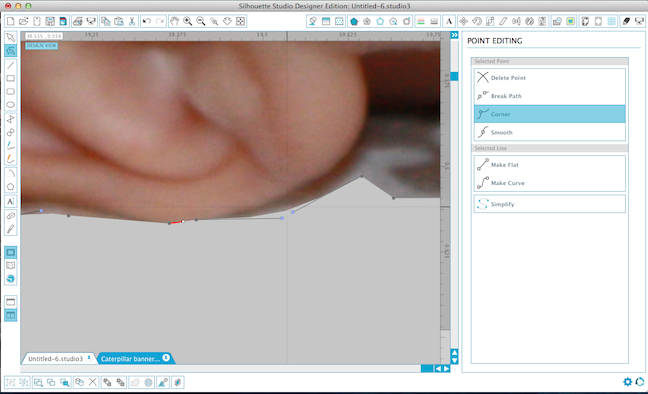 It also requires a more advanced knowledge of Silhouette Studio to accomplish this technique. In addition, the photos must have a clean and/or contrasting background in order for the trace to be effective. 1. Select trace area. With the mouse, encompass the part of the photo that will be traced. 2. Adjust the levels in the high and low pass filters until the main subject of the photo is mostly yellow. 3. 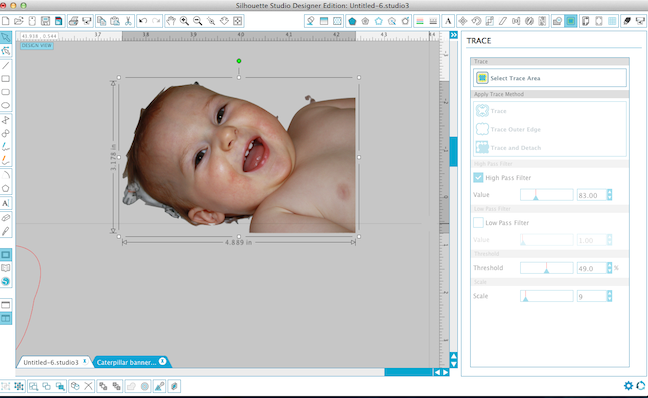 Select Trace and Detach. 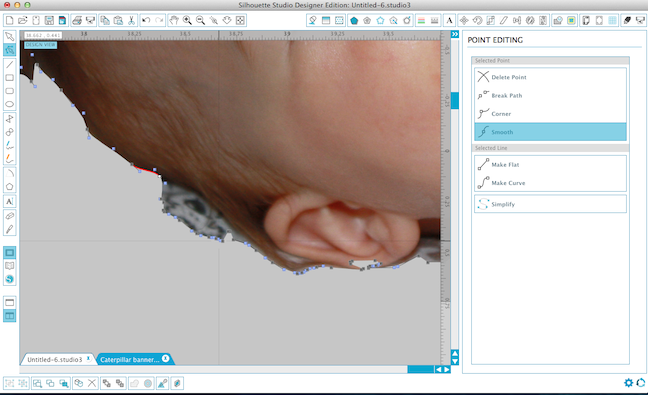 If there is background clutter included in the trace (like there is in my picture), remove this excess by editing the points. The edit points icon is located in the side bar. It’s the second icon down. Delete or add points to create smooth lines around the traced photo. Finally, here is the finished result after editing all of the points. It is still a little rough but from a distance no one will be able to tell the difference. 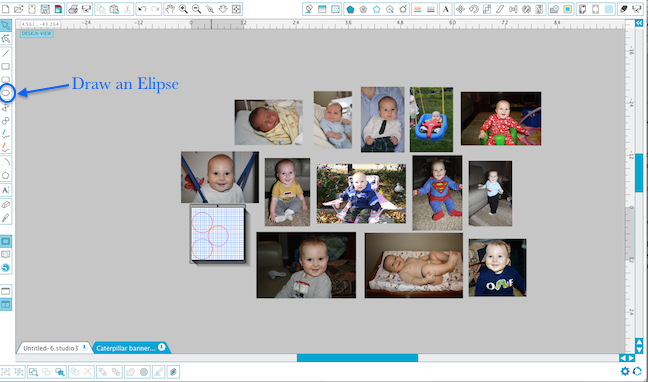 The traced photo can now be added to any shape or simply cut as is. I decided to add a background behind this photo and then I placed it on a butterfly. 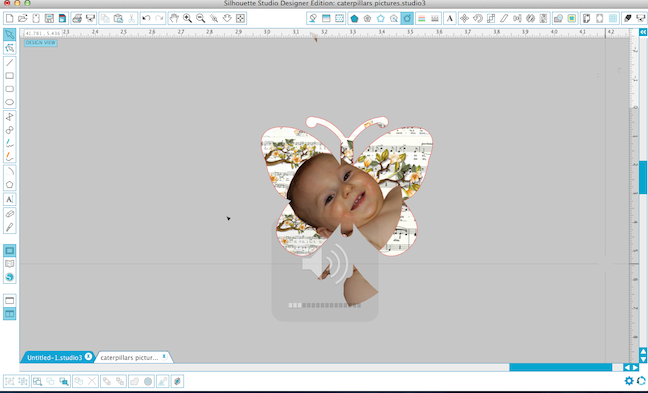 In the Modify window, select Divide in order for the picture to take the shape of the butterfly. Delete the excess parts of the shape. Group all parts of the shape together and select No Cut in the Cut Settings window. Import the butterfly shape again. The cut style for this butterfly will be set to Cut. 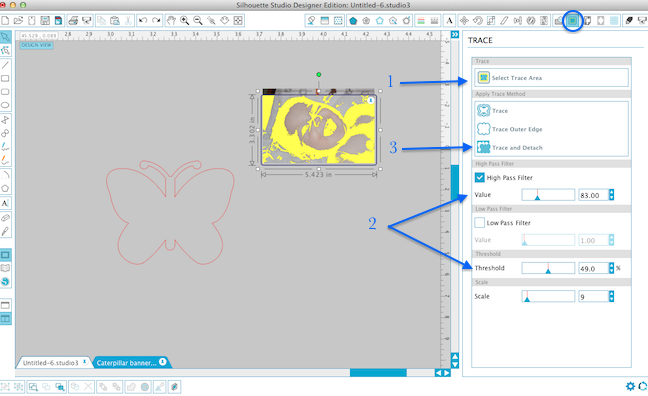 In the align window, select Center under the Align menu to make the two butterflies into one shape. If this process is not followed, it may be difficult, if not impossible, for the cut lines to show on just the outer edge. 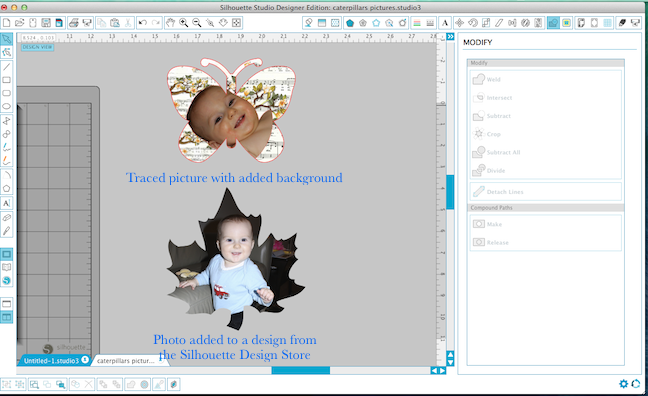 I hope that this tutorial will give you a few ideas on how you can add a photo to any design in Silhouette Studio. Let me know if you found this tutorial helpful and by all means, leave a comment if you have any question on how to use your Silhouette CAMEO. I would love to hear from you! Thank you so much for sharing this! I never realized I could do this. So useful. Your welcome Kim! 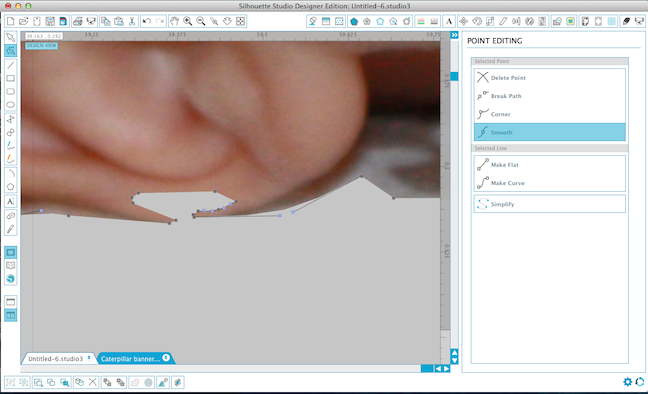 Silhouette Studio is a really awesome program isn’t it! Hi, Martha great photo editing tutorial indeed. Really I enjoyed and tried it. It worked for me. Thanks.